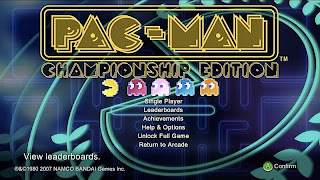 Anyway, the catalyst for the headline above: Namco Bandai is bringing the critically acclaimed Pac-Man Championship Edition to the iPhone and iPod Touch this Thursday! Actually, strike that--I am sure why I'm excited--I'm hopeful that this means the game will be released on other consoles in the near (or not-so-near) future. The rumor mill suggests it might show up on the PS3/PSP PSN service at some point in 2010, which would be fine with me--though you know I wouldn't mind if it showed up on the Wii as well. For more information on the iPhone/iPod Touch iteration of Pac-Man Championship Edition, check out this article over at GamePro.com. You may want to check out this YouTube video, too. Of course, I can't talk about Pac-Man Championship Edition without mentioning the following video--which shows a (supposedly) fan-made NES version of the game. Sadly, it seems to be a fake (no ROM is available for download, at the very least).